Check out our photo archives, full of amazing circus fun from 2002-present. This video also provides a slice-of-life at circus camp. Enjoy. Then sign up! Cost: $260 for one child, for one week. $240 per additional child, and/or per additional week per family. Please note that a deposit ($100 per child per week) is required at registration; with the balance due 4 weeks prior to the start of the camp you are signed up for. Partial Scholarships are available! What to expect: A morning warm-up will stretch and strengthen body, mind and imagination through new games and improvisation. We’ll master the basics of stiltwalking, juggling and low-flying trapeze, and explore the world of physical comedy including pantomime, clowning, and mask movement forms, as well as dabbling in tightwire, acrobatics, costuming and set design. As lifelong performers living in a state (and a town) that’s steeped in circus history, we have stories and images galore to share when it’s time for quieter activities. Camp closes on Friday with a special performance showcasing skills learned and joy discovered! Parents, families and friends are cordially invited. You send lunch, we provide a healthy afternoon snack. Our Advanced camp kids (ages 10 and up who’ve completed at least one week of the Wild Rumpus or other comparable program) get to add German Wheel, Rolling Globe, Aerial Silks, Aerial Improvisation and Theater/Comedy improvisation to their bag of tricks, as well as expand their performance horizons. In our first week, we’ll visit Circus World Museum and perform as walkabout entertainers on grounds. And at the end of two weeks, we’ll wrap all of these new skills into a grand finale performance! We are professional performers who have delighted audiences and students alike over the years with our hands-on, cooperation-based approach and our active love and sharing of circus arts. Kids of all abilities find themselves mentally engaged, physically active, and smiling as they learn new things. We love our work, and we adore our Wild Rumpus Alumnus! By the Seat of your Baggy Pants: A fun theatrical experience exploring masks, movement, mime, juggling and other cool stuff. Capture the comic vitality of the circus, Vaudeville, and physical comedians such as Charlie Chaplin, Buster Keaton, and Robin Williams. Students will study the value of physical expression and a variety of mime forms. Fun solo and group improvisational exercises will be explored using masks fromSwitzerland and the Italian Theatre. The Clown Character and Circus Skills will also be an integral part of this action-filledworkshop. Students will also learn basic 3-ball juggling techniques, and the art of balancing objects on the nose. Introduction to Low-Flying Trapeze:Experience the joy of swinging, hanging, floating, spinning, climbing and circling on the low-flying, single point trapeze. Students will learn the basic techniques of swinging big and changing directions in midair, flying in circles, and hanging upside down, right side up and sideways. They will also have opportunities for play, exploration and self expression in a safe, supportive environment. 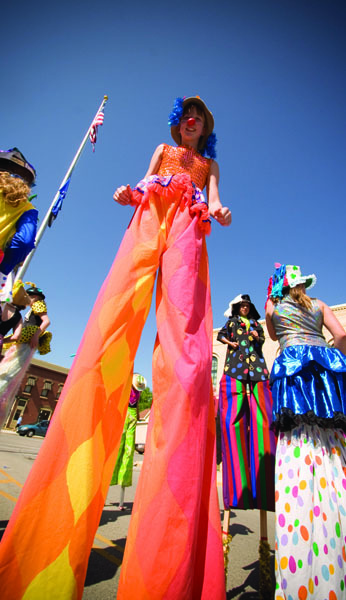 Stiltwalking: Throughout history stilts have been used for many high jobs like harvesting peaches, walking in soggy areas, washing windows, or in construction and painting. They have also been used in ceremonies, celebrations and rituals; not to mention the circus, throughout the world. Stiltwalking is great fun, confidence boosting, and not so hard to learn . It’s quite like riding a bike, once you’ve succesfully found the balance point you’re on your way. In stilt class students will learn to get up on stilts, walk, dance, stand still, and fall safely. Tightwire and acrobatics: Thrilling and integral parts of any circus, wire walking and acrobatics develop focus, concentration, balance, coordination and cooperation. Jacob Mills teaches physical comedy, juggling, pantomime, clowning and tightwire. Marcia Miquelon teaches stilt walking, aerial arts and acrobatics and serves as the administrative director for our Wild Rumpus camp programs. Other circus and education specialists help us fill our lead teaching team; and an awesome crew of high-school and college-aged assistants help us to give our circus students caring, positive, one-on-one instruction and mentoring. Read more: Who are these clowns?